Did Hatshepsut Intend for Neferure to Succede Her as King? The view of Aiden Dodson : THUTMOSIS III - FAMILY MAN. - In: THE OSTRAKON 15.2 - SPECIAL ISSUE ON THUTMOSIS III. - 2004. - pp. 3 - 7. The author examines the monuments of Karnak which are built or decorated by Hatshepsut and Tuthmosis III, and deals especially with those relating to the so-called dishonouring of Hatshepsut by Tuthmosis III. He concludes that the evidence shows that the destruction of Hatshepsut's monuments of Karnak cannot be dated before the 46th year of Tuthmosis III, and that an outburst of hatred of Hatshepsut by Tuthmosis III immediately after her death is not probable. The question remains open and needs a new inquiry. Thanks so much for the link. It's such a wealth of information. I'll spend a lot of time reading all the articles. Thanks again -- you're such a good resource. This picture would become much clearer if we knew for certain whether Neferure and Thutmose III ever had any children together and also whether any of these were alive at the time that Thutmose III chose Amonhotep II as his heir, presumably, but not necessarily, after the death of his eldest son Amonemhat. Here's another thought. The title King's Eldest Son is usually designated the royal heir but could a king whose eldest son turned out to be a disappointment, disinherit that son in favor of another? I'm not sure of that but I think he could. If Thutmose favored Amonhotep over Amonemhat and the elder son was still around, the dishonoring of Hatshepsut late in the reign begins to make sense, especially if Amonemhat was Hatshepsut's grandson. This theory would also work if he had a capable older daughter, especially one descended from the great queen herself. Unfortunately it's all just speculation, but does anyone have any reason why this can't have been true. I've already stated that Hatshepsut eased into the role of king because, according to her contemporary, Ineni, she already ran the land with no greater title than "God's Wife". Since this went on for a few years, people doubtless got accustomed to her as the nominal head of state--especially those men she had elevated to their positions. And how do you know that Tutankhamun, while still Tutankhaten, did not have a female regent, too? Is it really wise to trust what Ineni said on his tomb walls? He owed his position to Hatshepsut; he had a vested interest in making her out to be the one whom Egypt served with bowed head from the beginning. Seems like some folks in this thread are just taking Ineni's account at face value just because he was Hatshepsut's contemporary, without examining whether he may have had a motive for adjusting history. For myself, this just seems to be an argument trying to cling to the old way of thinking about Hatshepsut: that Thutmose III must have resented her and couldn't wait to be rid of her and assume full control of the throne. While it makes for good fiction, such a view certainly doesn't appear to be in keeping with modern evidence. I am much more interested in the original question posed in this thread: was Neferure possibly a candidate for heir? Now that is much more intriguing than trying to find ways to cling to the old view of the Thutmose III/Hatshepsut "conflict." We did get a bit carried away from the original topic, didn't we? According to the tomb inscription of Ahmose Pen-Nekhbet, Neferure was Hatshepsut's eldest daughter. Ahmose Pen-Nekhbet also says he was appointed as Neferure's tutor by Hatshepsut when she was "a baby on the breast." Senemen, who also served as Neferure's tutor, was a priest who was among other things a "Child of the Kap of Ahmose Nefertari". There is an inscription which suggests that he may have originally been a tutor of Hatshepsut although Catherine Roehrig, disputed this in "Royal Nurses & Tutors". At any rate, he apparently had long standing ties to the royal family. Senemen and his mother Senmiah, appear in the very fragmentary banquet scene in the tomb (TT71) of Senenmut. At one time it was thought they were brothers. Most scholars, today, doubt that. 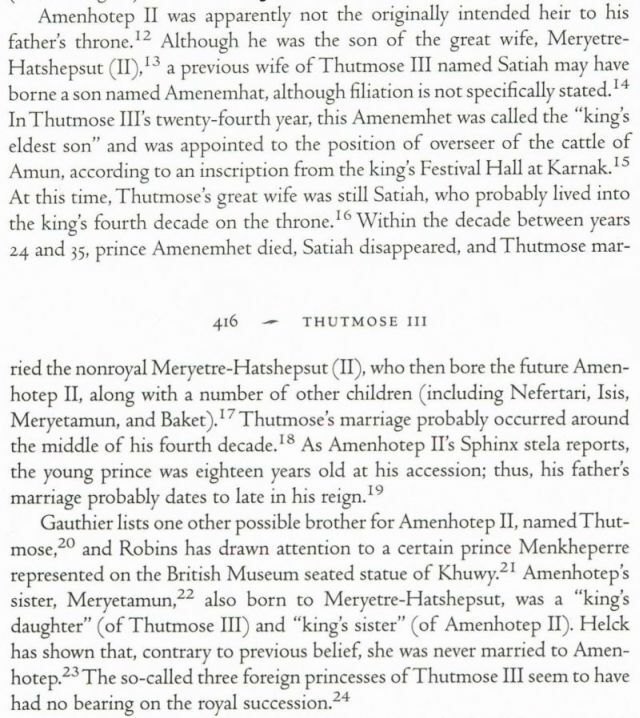 The two men had different mothers and there's no evidence that Senenmut's father Ramose had more than one wife. Senenmut served Neferure as steward of her estates, tutor and "Goddess's Father". There are many statues showing them together in different poses. Neferure in this context, appears as a juvenile. Neferure appears with her mother and sometimes with Thutmose III in inscriptions from the "Netjery Menu" which was apparently started by Thutmose II and finished by Hatshepsut when she ruled as regent for Thutmose III. She is shown here as an adult. Neferure inherited the office of God's Wife of Amon from her mother. Neferure is depicted in inscriptions in the Sanctuary of Amon at Djeser Djeseru along with her mother who appears as king, her half brother, Thutmose III and a younger princess named Neferubity. She is depcted here as an adolescent, wearing what some here have identified as the royal heir's wig, some artfully arranged jewelry and not much else. The depictions of Neferure here were not attacked or altered. Neferure was originally depicted in several places in the Festival Court at Djeser Djeseru. These depictions were later erased and replaced by depictions of her grandparents, Thutmose I & Ahmose, according to Safransky and Pawlicky, during the reign of Hatshepsut. Neferure may be the unnamed God's Wife depicted on the Chapel Rouge. Neferure is not depicted in Senenmut's Deir el Bahri tomb, nor does he mention any of his titles relating to her there. This has led some scholars to believe that she died before the tomb was decorated. A fragmentary statue of Senenmut bears the cartouches of Thutmose III and Neferure but apparently not of Hatshepsut. The last mention of Neferure may be the Cairo stela dating to some time after year 23 showing her standing behind Thutmose III. The name in the cartouche was at some point changed to that of Sitiah, Thutmose III's first Great Wife. If this is correct, then she, apparently outlived her mother. There are no known inscriptions of Neferure as King's Great Wife. It is unknown whether or not they were ever married or had children. Regarding Ineni's account, it is important because he is an eye witness. Of course, you're right, he was very much a courtier (a politician in our world) and a member of a very important family. You can't discount the possibility that he had his own agenda--not the least of which was eternal life--something he was not going to achieve if he offended the current ruler. On the other hand he's the best primary source we have for this period and can't be discount. Very interesting is also a statue of Senenmut and Neferura (London, BM, EA174, 1906,1115.1) in The British Museum. Here Neferura carries not only the side curl but also a beard (H.R. Hall in JEA 14, No. 1/2, 1928, pp. 1 - 2 : "... In No. 174 Neferure (who here too wears the side-lock and also a beard, like Khonsu) is held tightly by her male nurse and enveloped in the folds of his long funerary robe. ..."). I don't think that's a beard, she has her hand below her face and a finger and her thumb extended, albeit without the stone behind the finger removed (presumably to avoid breakage as this was a tough material to work with). It is interesting though because from a distance it looks like a beard. Aldred, Cyril : New Kingdom Art in Ancient Egypt During the Eighteenth Dynasty 1570 to 1320 B.C. - London : Alec Tiranti, 1961. - [2nd rev.Ed.]. - London : Alec Tiranti, 1961. - VI + 93 p., 175 ill. on 120 pl., map. Ratie, Suzanne : La Reine Hatchepsout - Sources et problèmes. - Lugdunum Batavorum : E.J. Brill, 1979. - 372 p., 16 pl. Meyer, Christine : Senenmut - Eine prosopographische Untersuchung. - Hamburg : Verlag Borg GmbH, 1982. - XV, 337 p., 8 pl., fig. - [Hamburger Ägyptologische Studien 2], on page 121, supported from Dr. Rosemarie Drenkhahn. I don't buy it's a beard because I can't find images of Khonsu with the beard and hand-to-mouth. Furthermore, this sculpture was produced before Hatchepsut was King, as she is referred to as God's Wife. If she had not yet taken on the Royal beard, why would she have her daughter shown with one? It seems to me, that until Thutmose III produced a son, that Neferure, who as far as we know was the only other living child of Thutmose II, actually WAS the heir to the throne. If Thutmose III was very young at the time of his accession, let's say a year or two old, that blessed event was going to be a long time coming and there was also a pretty good chance that, despite the best possible care, the boy king might not even make it to the age of puberty. Having it set in people's minds and before the gods that she did have a "Plan B" would have been a prudent thing for Hatshepsut to do in order to ward off dynastic challenges. This would explain Neferure's prominence in the regency period and the early part of the co-regency and also some of these intriguing depictions of her as a possible crown prince. Once the king had a son, Neferure was no longer first in line for the throne hence the reworking of her imagery. It could have all been as undramatic as that, though of course what Neferure herself thought of it can only be imagined. Note to "Senenmut and Neferura" (London, BM, EA174, 1906,1115.1) ... I think just from the photos on the BM - Homepage one can not really clarify the question. Especially since not even a side view is available. Maybe someone from London can have a look / make a better picture? Posted: Sun Sep 15, 2013 5:30 pm Post subject: crownprincess?? I have never come across any statement of a pharaoh's sister being the heiress to the throne and the official crownprincess. We have seen the daughters and sisters of a Pharaoh marry his successor who is not his son or even a close relative but women were not heiresses to the throne. In a few instances women ruled and to the best of my knowledge they only did so because there was no adult male ruler when they took to the throne. Thutmosis III was still young and had a great royal consort and like other monarchs a harem. The Great Royal Wife may not have given birth to a son yet (she might very well have been Nefereru herself) but that does not make his half-sister the heiress to the land.